From 18-22 September 2017 IUFRO will celebrate its 125th Anniversary Congress in Freiburg, Germany. Coincidentally, the current issue of IUFRO News is the 125th edition of the electronic newsletter. 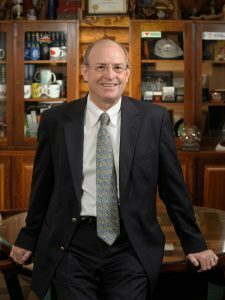 This presents a perfect opportunity for an interview with IUFRO President Mike Wingfield, specifically to hear his views of the achievements of IUFRO during the past 125 years, but also what he sees as the challenges that lie ahead. Furthermore, what his hopes and expectations are for the forthcoming Anniversary Congress. Q: Professor Wingfield, in the second half of the 19th century a substantial reduction of forest stands in mountainous regions of Central Europe was one of the main factors responsible for extreme floods. This problem and an increasing interest in learning more about the interrelationship between forests and climate, among other things, called for more effective international collaboration in forest research. And this led to the establishment of IUFRO in 1892. Today, 125 years later, why is there still a need for international science collaboration? What are the main challenges today? A: It is now widely accepted that collaboration and especially international collaboration is a major driving force in global research across all scientific disciplines. It drives not only the amount of research conducted but also the quality of research. And this is precisely where the global IUFRO network plays a huge part. Our many research units have always been very actively engaged in collaborating on all of the major issues facing forests and forestry, and will continue to do so in future. One of the current challenges coming to mind is an unfortunate global trend focused on establishing boundaries rather than breaking them down. However, the past 125 years have shown that IUFRO has managed quite successfully to overcome such boundaries and facilitate free scientific cooperation. Another challenge certainly is for us as forest scientists to more effectively communicate the outcomes of reliable research to stakeholders and policy makers. Q: After international cooperation in IUFRO had come to a halt due to World War I, it was not until 1926 that forest scientists met again at an international forum, the First World Forestry Congress in Rome. They immediately set out to revive the organization and make it more open with regard to membership and the inclusion of scientific themes. Today, IUFRO has members and officeholders in 125 countries worldwide and a scientific structure that addresses a very broad range of issues. What should IUFRO aim for in the future in terms of its scope and membership? A: The first and most important point to make here is to consider what makes IUFRO DIFFERENT to other organizations that are involved in supporting various aspects of forests and forestry. Here IUFRO’s mandate is very clear in having a focus specifically on research and in doing so globally. There is no other organization that links forest researchers in the way that IUFRO does. But there are also challenges. One of these has to do with the extensive number of scientific fields that forestry encompasses. We need to attract researchers from specialist fields that study trees and forests but do not see themselves as foresters. Here I for example consider my own field of interest – plant pathology and entomology. There are many pathologists and entomologists who work on trees but do not participate in IUFRO. We miss opportunities in not engaging with them – they miss opportunities in not being part of IUFRO. Q: The period after World War II until the mid-1970s was characterized by worldwide change, continuous economic growth and the growing visibility of developing countries on the global scene. In those years IUFRO also experienced a record growth, a great diversification of scientific themes and a growing representation of scientists from developing countries. In recognition of the specific needs of scientists from economically disadvantaged countries IUFRO has worked towards strengthening their capacities for science cooperation since the 1980s. Why is it still so important in today’s world? Is there one particular achievement in that area that stands out in your mind? A: With my home country South Africa being in the so-called developing world, this is a topic of particular interest to me. During my time with IUFRO I have seen substantial advances in the manner that IUFRO is engaging particularly in countries of Asia, Africa and Latin America. Here I must also mention our Special Programme for Developing Capacities (IUFRO-SPDC) that has done an amazing job in providing training courses and other research support for forest scientists from economically disadvantaged regions. But we have a lot more to do. Following on my comments above, collaboration is the key to success in research. And when one looks at high impact research from developing world countries, it is very clear that this often emerges from global collaboration. Here I see huge opportunities for IUFRO to more effectively link forest scientists across global boundaries. Q: In the past 25 years we have witnessed a growing awareness of the limits of natural resources. Consequently, the idea of sustainability has been widely accepted as a guiding principle also in research. In 2015 the Sustainable Development Goals were adopted with the aim to end poverty, protect the planet and ensure prosperity for all. How will IUFRO contribute to attaining these goals? A: As a global network facilitating forest research, IUFRO plays a crucial role in promoting the Sustainable Development Goals. This is because FORESTS are so important to the future of our planet and its people. IUFRO’s very active role in the Collaborative Partnership on Forests (CPF) with its lead in the CPF’s Global Forest Expert Panels Initiative (GFEP) and our Task Forces that promote activity and understanding of key issues linked to the SDGs are examples. But it is the incredible network of more than 15000 forest researchers globally, seeking answers to problems and challenges facing the worlds’ forests where our greatest impact on achieving the SDGs is. As an educator, I should also add that IUFRO’s role in promoting and supporting particularly higher education in forestry is an important element of all of these efforts. Q: The 125th Anniversary Congress of IUFRO will be a fine opportunity not only for presenting research and exchanging knowledge but also for strengthening the IUFRO network and increasing the visibility of IUFRO. What are your personal expectations for this Congress? A: It is a great privilege for me to be serving as IUFRO President at the time that we are to celebrate our 125th Anniversary. And I am looking forward to meeting with many colleagues and friends in Freiburg in just a few months’ time. Freiburg is a delightful city and we are set to enjoy a remarkable congress fitting with the fact that our organization has reached its 125th year. The meeting will bring together very large numbers of forestry scientists and policy makers. In addition to a very high level of scientific exchange that has been facilitated by a superb Congress Scientific Committee, it will also include new elements of debate and discussion that intersect areas of concern regarding the future of forests and forestry. Overall, we will have the opportunity to look back over the rich and interesting history of IUFRO and to celebrate the accomplishments of our past. But we will also look to the future where knowledge from forest research is set to be more relevant than ever before. Describe in one picture: What does “Interconnecting Forests, Science and People” mean to you? FORESTS: This picture is of Acacia xanthophloea, an iconic species with a wide distribution in sub-Saharan Africa including in my home country South Africa. With its beautiful yellow stems – it stands out in the African landscape. 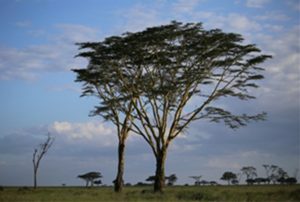 SCIENCE: As a tree-health specialist, I am concerned that these trees are dying in many areas including the Serengeti plains, illustrated in this photograph. The cause is unknown but I believe that this has to do with a combination of many factors including damage to the stems of the trees by elephants and infection by wound-infecting fungal pathogens. PEOPLE: Acacia spp. such as the A. xanthophloea provide shelter and food for the many mammals native to Africa and these are components of ecosystems very relevant to the people of Africa. They grow in moist areas where mosquitoes breed. As a consequence, people taking shelter in forests of A. xanthophloea in the past would contract malaria and develop fever – thus the name “fever trees”. In "125th Anniversary Congress", "Interview"